As the professional China investment casting manufacturer, alloy Steel investment casting is another kind of investment cast made by Taiyuan Simis Precision Casting Co., Ltd. Alloy steel is one kind of steel adding other elements in addition to iron and carbon. It can obtain special properties like high strength, high toughness, wear resistance, corrosion resistance, low temperature resistance, high temperature resistance. The main elements of alloy steel are silicon, manganese, chromium, nickel, molybdenum, tungsten, vanadium, titanium, niobium, zirconium, cobalt, aluminum, copper, boron, rare earth, etc. Taiyuan SIMIS Precision casting foundry usually use those following material, such as 42CrMo, 20Mn, 8630, 8620, 4140, 4130, 35CrMo, 20Mn5, 40CrNiMo, and so on. Taiyuan Simis manufactures alloy steel investment casting technique with Lost Wax Casting process for our customers. According to the total number of alloy elements, alloy steel investment casting can be divided into two major categories of low-alloy steel casting and high-alloy steel casting. 1. Low alloy steel investment casting: the main application of manganese, silicon manganese and chromium, etc. like ZG40Mn, ZG30MnSi1, ZG30Cr1MnSi1, and so on, mainly used to cast gears, hydraulic cylinder and turbine rotors and other parts. However, ZG40Cr1 is often used to manufacture high-strength gears, high-strength shafts, and other important force parts. 2. High-alloy steel investment casting：With wear-resistant, heat-resistant or corrosion resistance and other special properties, such as high-manganese steel ZGMn13, is an anti-wear steel, mainly used in the manufacture of friction in the dry operating conditions used parts, such as excavator grab and grab teeth, concrete pump parts, crawler tractors and tanks, etc. Chrome-nickel stainless steel ZG1Cr18Ni9 and chrome stainless steel ZG1Cr13 and ZGCr28 etc., has high corrosion resistance to nitric acid, mainly used for the manufacture of chemical, petroleum, chemical and food equipment parts. Comparing with Carbon Steel Investment Casting, the properties of alloy steel investment castings are better than carbon steel investment casting and its application is becoming more widely. 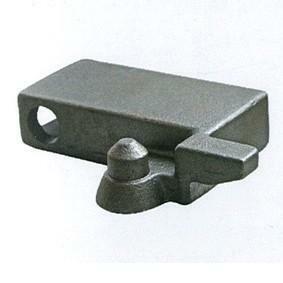 But the price is higher because of the advantages of alloy steel investment casting. We often use them to manufacture excavator bucket teeth, concrete pump elbows, steel clamps and agricultural castings for tillage points, etc.